The splendid, eye-catching appearance of these Blue Devil’s simply can’t be ignored. 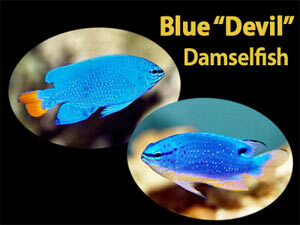 Despite having a bit of the “devil” in their personalities, these two damselfish are extremely popular with aquarists. The marvelous electric blue coloring of both the Blue Devil Damselfish Chrysiptera cyanea and the Fiji Blue Devil Damselfish Chrysiptera taupou is truly a bonus. On each the blue is then magnified and contrasted with brilliant yellow accents. 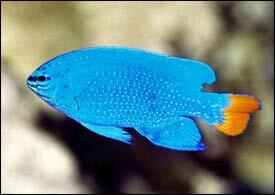 The Blue Devil male has a yellow-orange tailfin and sometimes yellow on the nose while the Fiji Blue Devil has its yellowish-orange coloring along the top and bottom, along with small yellow dots on its body. Adding to their attraction is a small size and incredible durability. They only grow to about 3 inches in length which makes them suitable for a moderate sized tank and they are quick to adapt to their home. They are also moderately priced and have hearty appetites. All these qualities can make them great for beginners, but there is one caveat, they can be extremely belligerent, especially as adults. Adults can be so cantankerous that they usually have to be kept alone in a small tank, or as a male/female pair. Only in a larger tank that has lots of caves and crevices in the rockwork or among corals can other fish really be considered, and then the selection must be done very carefully. 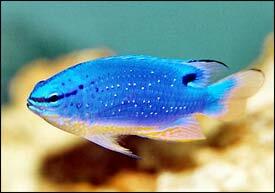 Damselfish that are dubbed “Devils” is due to their extraordinary aggressiveness and quarrelsome behavior. These fish are no exception. In fact, the Fiji Blue Devil is considered the most aggressive member of the genus and very likely the most belligerent of all Anemonefish and Damselfish in the entire Pomacentridae family. The Blue Devil is the more amiable of the two and able to be kept with a wider range of fish, so make sure you don’t get them mixed up! These are truly awe-inspiring fish, just make sure you’re aware of their aggressive nature at maturity. Be ready to deal with a bit of the “devil” and then either of these hardy fish can make a spectacular showcase in your aquarium for many years! Learn more about these stunning Blue “Devils!” See pictures and get more information on the Three Stripe Damsel Dascyllus aruanus and the Four Stripe Damselfish Dascyllus melanurus along with their aquarium care, behaviors and breeding! Do you have a story to tell about these aquarium “devil” damselfish? Sign up on Pet Talk where you can join in conversations about them (or any other animals) and share your experiences!